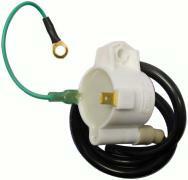 This is another imported universal 6 or 12 volt ATV/Motorcycle coil. It has been tested with the TIM-6 ignition module and produces a pretty good spark with just 6 volts, and should work fine on most any model IC engine. The core is entirely contained within the coil and thus is lighter and requires less space (at the expense of not being quite as stong). Connections are simple - one prong for positive, and one prong for negative. Be sure to connect the negative to the engine head as well (ground). It includes approx. 18" of spark plug wire. The coils are enclosed in a plastic cylinder and potted with epoxy. This makes them very rugged and oil/fuel proof. This coil draws less than the 1 Ohm minimum Dad recommended for the TIM-6, causing the TIM-6 to run hotter, but should not be a problem as long as the TIM-6 is sufficiently heat-sinked. This is a good alternative coil if space is tighter. Approx. size: 2.25" x 1.5" x 1.5"
Operating voltage: 6 to 12 volts DC.